The English term “caregiver”, that literally means “who gives the care”, is used to indicate anyone who provides care to and support a sick person. Often in Italy, the caregiver coincides with the figure of a family member or a loved person, a friend, a neighbor. And very often it would be better to talk about “the female caregiver” because the numbers indicate a higher percentage of 70% of women who care for their loved ones, compared to men. Understandably, when a loved one has some serious health impairment, all our strengths are dedicated to taking care of them, often forgetting to take care of ourselves. The physical, mental, wearisome, persistent fatigue over the years, which we encounter in the helping professions, including home caregiving, is a state known in the scientific world with the term compassion fatigue. The World Health Organization (WHO) has defined “health is a state of physical, mental and social well-being and not only the absence of disease and infirmity”. It has been demonstrated that a state of persistent suffering, dictated by frustration, abuse, daily psycho-physical violence associated with caregiving can lead to a condition of high stress that, over time, can even result in real physical and mental pathological syndromes more or less serious for the family member who assists . In 1976 Hans Seyle defined the term stress as “breakage or wear in the face of environmental stresses, with a negative value”. Although the stress threshold level is a highly individual behavior when this threshold value is exceeded a critical state called burn-out can be achieved. Often defined as “the syndrome of helping professions” (such as doctors, social workers, teachers …), it can be said that even the dual role of family and caregiver, unfortunately, have all the attributes to prepare the person who assists in incurring such a syndrome. The burn-out is generally manifested by physical and emotional fatigue, detached attitude, apathy in interpersonal relationships and feeling of frustration. Moreover, recently, neurosciences have demonstrated the correlation between the surrounding environment, the biological flight or fight response of the human body and the ability of physiological immune response, opening the door to a new discipline called “psycho-neuro-endocrin-immunology”. This molecular mechanism also suggests a direct correlation between the psychic stress to which the role of caregiver is exposed and the appearance of physical diseases of the caregiver itself, (such as cancer, cardiovascular disease, infections, diabetes) due to deficiencies in immune activity . In our country, the family plays a key cultural role in the life of each of us and there are growing awareness and attention in the health field to the figure of the caregiver. Since its foundation in 2002, the Healthcare Area of ISTUD Foundation has carried out important researches on many public health issues, as patients’ quality of life, doctor-patient communication, and pioneering the role of the caregiver. The first project published under the name of Healthcare Area, indeed, aimed to investigate and assess the quality of life of families with a terminally ill patient, the impact of palliative care service and the financial impact for the family itself (“LA FAMIGLIA E IL MALATO TERMINALE – 2005”). The importance of an investigation that includes the entire affective-familiar context of the patient is expressed both in outlining a three-dimensional picture of the patient’s experience and through multiple implementations at the institutional level. The life balance of the family that assists a chronic or terminal patient is, therefore, to all intents and purposes, a highly informative and effective tool for directing the actions of the operators involved in the services with greater awareness. The method used for this purpose includes the application of narrative medicine and qualitative research as tools with high information power compared to many standardized quantitative tests on the quality of life of patients. In a recent interview, Angelo Mastrillo, Secretary of the Permanent Conference of Degree Classes in the Health Care Professions, said that the professions that will be the most important in the future will be those for the third age, confirming that the care of the elderly, often suffering from chronic, neurodegenerative or terminal diseases, is a particularly topical issue. Not infrequently, the frantic rhythms at work of younger family members are not always in line with the multiple cares that the sick person needs; therefore, the family has often to ask for support from a professional, a family assistant, a health and social worker, a nurse. The role of the family caregiver in caring for the elderly is also a topic of particular interest for our research team. Some examples: the book HISTORIES OF LIFE IN THE YEARS OF SILVER (STORIE DI VITA NEGLI ANNI D’ARGENTO), a volume that contains more than 50 narratives, a testimony to many voices on the fragility of the ‘grey temples’, but also on the strengths and resources available to the elderly and families; “Needs and costs of people with spinal paralysis and of reference households” of 2009 (“Bisogni e costi delle persone con lesione midollare e dei nuclei familiari di riferimento” del 2009) involved 218 people with spinal cord injury and 63 people belonging to their family/friends (caregiver); it highlighted innovative aspects of adult caregiving to people with disabilities, undeclared difficulties, institutional deficiencies in economic and employment support. Some ISTUD projects in which the strong emotional and physical stress of the caregiver-family has emerged in a preponderant manner are: the project “Back to Life” (2014), which investigated the so-called “burden of illness” of people affected by myelofibrosis and their families; “The life of people with immune platelet disease” (2016) which had as its objective to bring out the lives of patients with a serious blood disease and their caregivers; “Living, assisting, treating the person with prostate cancer in the metastatic phase” (2017) which has outlined a particularly dramatic picture of life for patients, mainly because of the severe pain caused by bone metastases and has revealed a strong emotional and physical pressure on their wives who assist them. On the international scene, the role of the caregiver is often confined to a few selected areas of particular interest to the scientific community, such as care for the elderly, but also mental illness and cognitive difficulties of children, adults and the elderly. 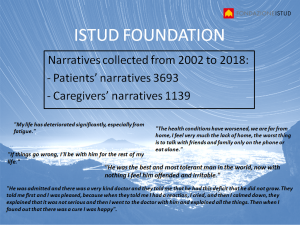 However, as evidence of the strong interest of ISTUD in the whole cosmos around the figure of the patient, there are many projects that have investigated the role of the caregiver in the care of patients. 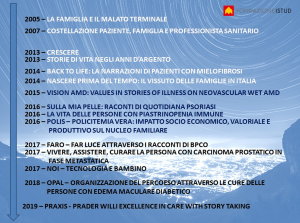 In 2007, the project PATIENT, FAMILY AND HEALTHCARE PROFESSIONAL CONSTELLATION (COSTELLAZIONE PAZIENTE, FAMIGLIA E PROFESSIONISTA SANITARIO) investigated the entire “social constellation” of the patient, from domestic life to the relationship with the caregivers. “This role of carer, nurse, assistant became more prevalent than my role as a wife. This is dangerous in a couple relationship. I help her to keep in mind that she is there as a wife. The more other figures there are, the more the couple balance works. It is important to keep the two roles separate. I’ve learned that over time. A recent intervention by the Italian Ministry of Health indicates the woman as the real caregiver of the whole family, the backbone of health within the walls of the home. From 2013 to 2017, many women, mothers and wives have left their precious testimony as caregivers through the ISTUD channels. Among these, the CRESCERE project (2013 – 2016 http://www.medicinanarrativa. ).eu/growth) for the first time provided for the application of narrative medicine to the study of children with stature deficiency, the project Birth before time (2014) investigated the experience of parents, especially mothers, of prematurely born babies, the project NOI (2017) that explores the role of technology in the management of diabetes and the project to live, care for, treat the person with prostate cancer in the metastatic phase (2017), an important work of listening to wives, life partners of patients with prostate cancer. Desperation and suffering are fortunately only one side of the coin; in fact, there are numerous testimonies collected by the Healthcare Area of ISTUD Foundation, examples of positive and resilient families and patients, examples of coping, or creative strategies that patients and caregivers have adopted to overcome physical limitations, obstacles due to the disease, with which they have been able to react positively, not being discouraged and giving themselves real moments of serenity despite the ordeal of the disease. This further underlines the importance of continuing the research and deeper understanding of the role of the caregiver, in particular to disseminate the need for institutional and social support, proximity to the families of sick people and to raise awareness of the problem.